2# Have You Ever Wonder? For once a while, take a close look on a pretty cat’s face. Observe the colors and patterns. Don’t they look as if they’re wearing make up? Starting from the eye shadow, mascara, blush on, and lipstick. 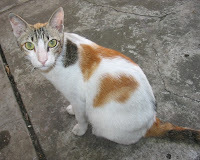 Most probably, I think the human put up some make up were actually adopted, or developed from cats colors and patterns. Then, I remember how ancient Egypt worship cat as their Goddess. So, again, humans are inspired by cats pretty face. Thank you my dear feline. There are also few opinions who disagree with the aforementioned finding. Some of their reasons are the ancient Egyptians were great users of make-up, but never heard of it as having anything to do with the cat goddess, Bastet and wouldn't have thought that she would be particularly associated with make-up, as she had the head of a cat. According to the most recent anthropology findings, the use of "make up" predates written history, in that it was used as far back as the cave dwellers. Make up as a form of beauty enhancement can be traced back to before the Egyptians became a nation state...with China and the orient having the first known depictions of people wearing some type of make up to enhance various parts of the body. It is believed that the Egyptians are however the first group of people to utilize make up as part of their daily lives and extensive trade of Kohl is depicted in their writings. The practical reason why ancient Egyptians of both sexes and all classes used kohl on their eyes is that darkening the skin around the eyes helps reduce the glare of bright sunlight - something you get a lot of in Egypt. Of course, once you start putting stuff round your eyes, you want to make it look attractive too. Feline and Human. They are both inspiring towards each other. very much appreciated furr your encouragement Marian:) yup, indeed I wanna present something unique and intriguing about the correlation between feline world and ours...loss in bedazzlement. You drop at my blog asking for my feedback about your blog. Well, everything is fine with me. Not bad for a first timer like you :D I used to be like you too but as you hop on the blogosphere, you will learn a lot. Just drop by at my blog anytime and hope you will learn there, okie? The website is actually hosted by yahoo small business. They charge a small fee of $11.00 per month, which includes the domain name and registration. I downloaded yahoo's site builder for free, and was able to get the page up in a matter of hours. It's really easy to use. I looked at some other free services, but most of the web domains (I believe thats what you call them...) where really long and I thought it might make it to hard for anyone to find Moki's webpage. The revenue I generate from the Ad Sense ads placed on the site, more than cover the monthly fees of hosting it. Other than the $11.00 a month I'm paying to yahoo, the remaining money I am making off Ad Sense goes to cover Moki's medical bills. Aren't us organge and white cats the greatest!! !